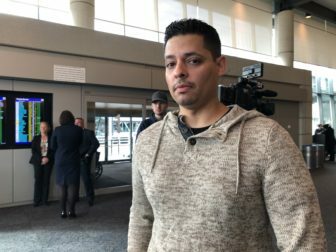 Behavior Detection Officer Adrian Pellot said he might need to get a second job because of the government shutdown. “It’s more nerve-wracking because of the fact that if this shutdown lasts any longer one us is going to have to find something,” Small said. About 25 percent of the federal government closed after funding ran dry Dec. 22, including the Department of Homeland Security, which has authority over the TSA, There are more than 8,000 federal workers in Connecticut, and Pellot and Small are among 1,500 affected by the shutdown. Some of those impacted workers, like Pellot and Small, are considered “essential” and required to work without pay. Others were furloughed. Pellot and Small were among a handful of federal workers and union officials who met with Sen. Richard Blumenthal on Monday morning. 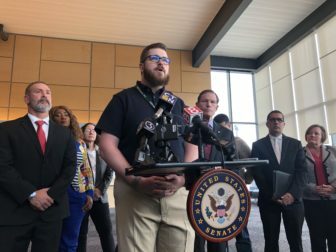 Blumenthal said those TSA workers and roughly 40 air traffic controller at Bradley who work for the shuttered Department of Transportation are suffering ‘”real harm and hardship” from the longest government shutdown in U.S. history. “It is also having a rippling effect throughout our economy—it is impacting industries and economic development and real jobs, … real people who need their pay and income,” Blumenthal said. He called on the state labor department to give those who are working without pay unemployment compensation, just as it will be doing for furloughed employees, and said lawmakers should change the law if necessary. The senator also criticized Senate Majority Leader Mitch McConnell for failing to call a package of bills to the chamber’s floor that would reopen the government. “If he calls these bills to a vote this afternoon they will pass … and if Donald Trump vetoes them, I believe there will be enough votes to override that veto,” Blumenthal said. Christopher Scofield, a technician at Bradley International Airport, speaks at the press conference on Monday. Christopher Scofield, a technician who works in Bradley’s control tower and on the airfield, said he is currently picking up as many shifts as he can at his second job as a Zamboni driver at a local skating rink. Scofield said his washing machine broke last week and he is not sure when he will be able to replace it. “Then we can worry about a physical security fence or whatever they want, but before any of that needs to happen, how about we pay the people, how about we do what the government is supposed to do and debate that in another venue rather than using us as a poker chip,” Pellot said. Voters say, “Mr. President, it’s on you” said Tim Malloy, the poll’s assistant director. But federal workers affected by the shutdown won’t get any relief until the closed agencies are reopened — and because Congress approved legislation last week that would allow it — these workers are also likely to receive back pay.